Close-up view of stylish female feet. 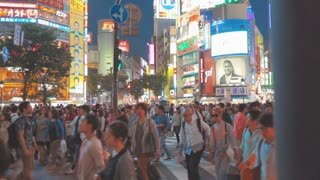 Businesswoman crossing the road in crowded downtown. Slow motion. 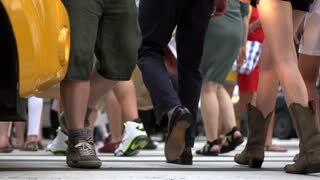 Close-up view of female feet walking through the downtown. Businesswoman wearing shoes with heels. Slow motion. Young stylish businesswoman crossing the road in financial district of New York, America. Slow motion. Close-up view of young businesswoman wearing shoes with heels crossing the road in busy downtown. Slow motion. Close-up view of young stylish woman with shopping bags crossing road in new York, America downtown in the evening. 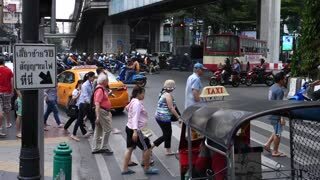 Pedestrians Crossing Intersection in Crowded City Center. Cinematic Slow Motion. 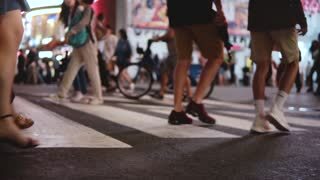 Beautiful slow motion shot of young female freelancer crossing a busy crowded street at night in Times Square, New York. Slow motion lifestyle shot of young female fashion blogger crossing a crowded street at night in Times Square, New York.